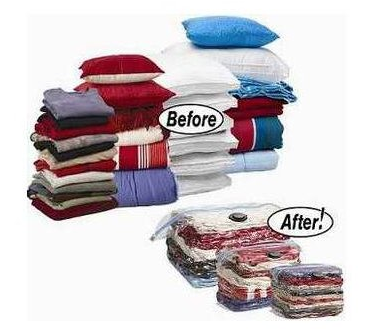 Perfect for comforters and blankets, pillows, patio cushions, sweaters and jackets, and other bulky items, this set of three vacuum-seal bags helps create extra storage space. To use, simply add the items to be stored, zip up the bag using the easy-to-seal Sure-Zip slider, and remove the air that creates bulk using a household vacuum. The patented one-way valve works with any standard vacuum-cleaner hose. The bags not only compress bulky items for more compact storage, but they also create an airtight seal for ultimate protection from dirt, moisture, mildew, bugs, and odors. Living in an older Colonial home has it's charms, non of which include the compact closets! Space Bag's have helped me immensely with keeping my household's clutter in check. Every season, I go through all of our clothes and weed out everything that can be put away; pack it neatly into a Space Bag, and shrink it down quickly with our vacuum attachment (I love to watch as the clutter goes from VAST, to barely there!). 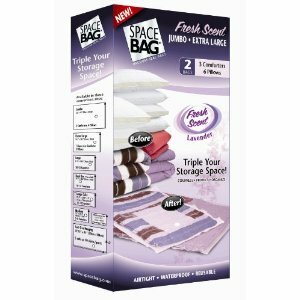 Just when I didn't think Space Bag's could get any better.......they introduced the all new Lavender Scented Space Bag! With a soft scent of Lavender (not overpowering at all ), I was excited to pack everything away as soon as they arrived. I have now successfully packed up Winter (goodbye bulky coats, sweaters, hats, gloves, and scarves! ), and have the confidence of knowing that our clothes are protected from the elements and unwanted odors (who really wants their wardrobe to smell like the attic?). I know that when we go to retrieve our Winter clothing from the attic in the Fall, it will smell just as clean and fresh as the day that we packed it all away. Thank you Space Bag for making my space work for me, rather than against me! Ready to pack away Winter? De-clutter your closet a little? The new Lavender Scented Space Bag's are just what the doctor ordered! You can find the new Lavender Scented Space Bags at a retailer near you and online at Amazon. Ready to pack away Winter in your home too? One Lucky Winner will receive a set of Lavender Space Bags (Includes 1 Extra Large Bag, and 1 Jumbo Bag)! Leave a comment~ Which room or closet in your home could use a little de-cluttering? The comment is considered your entry. Entry to this giveaway ends at 12pm PST May 10, 2011. Winner's are chosen randomly through random.org. The winner will be announced in a post within 7 days of the giveaway ending, and contacted through email. The winner will have 48 hrs. to respond or another winner will be chosen. Where to start...my linen closet needs major de-cluttering; I have too many bulky comforters. Then, I will have to do my closet; time to pack away the winter clothes. Retweeted @chamoqueen and followed and Liked Space Bag on Twitter and Facebook. how about everyroom??!!?? just kidding, i could use some space with condensing down my blankets with the hot weather coming to texas i do not need those for a while :) good luck!! I am your newest follower from Moms Blogger Club! Aprils Lifestyle Show Great blog here! I need to store my winter comforters and duvets, so I'll say bedroom. My Linen closet needs so help! My bedroom closet, no doubt! I have about 3 closets worth of clothing crammed in there!